Candidate James “Smuggie” Mitchell speaks at a press conference of local, state and national groups endorsing him and several other candidates for Charlotte City Council. Photo by Matt Comer. The slate of candidates endorsed mutually by the groups includes at-large hopefuls Julie Eiselt, Billy Maddalon and former councilmember James “Smuggie” Mitchell. Additionally, the groups have endorsed incumbent at-large candidate Vi Lyles, as well as district candidates LaWana Mayfield, Al Austin and John Autry, all incumbents in their respective districts. MeckPAC separately announced they will endorse incumbent Patsy Kinsey and Chris Turner, a Democrat challenging current District 7 Republican Ed Driggs, in the general election. Of the entire slate, four candidates identify openly as members of the LGBT community, the most that have run for council in the city’s history. These candidates include incumbents Mayfield and Austin and newcomers like council candidates Maddalon and Turner and mayoral candidate Roderick Davis. The groups’ mayoral endorsements were not announced today, with organizers stressing their focus on the Council seats. The new campaign will be investing in field organizers, cash donations to candidates and volunteer recruitment for their chosen campaigns. Organizers have declined to say exactly how much they’ll directly spend in attempting to swing elections toward their desired pro-equality outcome. In 2013, MeckPAC contributed $7,000 directly to council races. On Tuesday, MeckPAC Vice-Chair Jamie Hildreth said his group hopes to spend more this year. The success of the TurnOUT Charlotte campaign relies mostly on field organizers and get-out-the-vote efforts. The Human Rights Campaign has assigned a field organizer to live and work in Charlotte until the primary elections. Equality NC has also temporarily moved one of its staffers to its Charlotte office, where two staff people are already on the ground. Sgro will also regularly be working in Charlotte. Organizers said volunteer recruitment and canvassing efforts have already begun. The new campaign comes as the result of March’s failed LGBT-inclusive non-discrimination ordinance vote. At that time, a large coalition of local, state and national groups attempted to pass updates to several city non-discrimination ordinances, including protections against discrimination in public accommodations. The full package was rejected in favor of a compromise that stripped protections for transgender residents. Surprisingly to some, that final compromise package was also rejected in a final 6-5 vote. Scott Bishop, a member of the Human Rights Campaign’s national board of directors and chairman of MeckPAC, said the new campaign is a direct reminder that Charlotte’s leaders will be held accountable for protecting LGBT residents. He pointed to several southern cities, including Atlanta, Dallas, Columbia, Charleston and Myrtle Beach, which already have LGBT-inclusive public accommodations ordinances. “It is past time for Charlotte to join these cities and backing these protections must be a priority for the next City Council,” Bishop said. TurnOUT Charlotte! 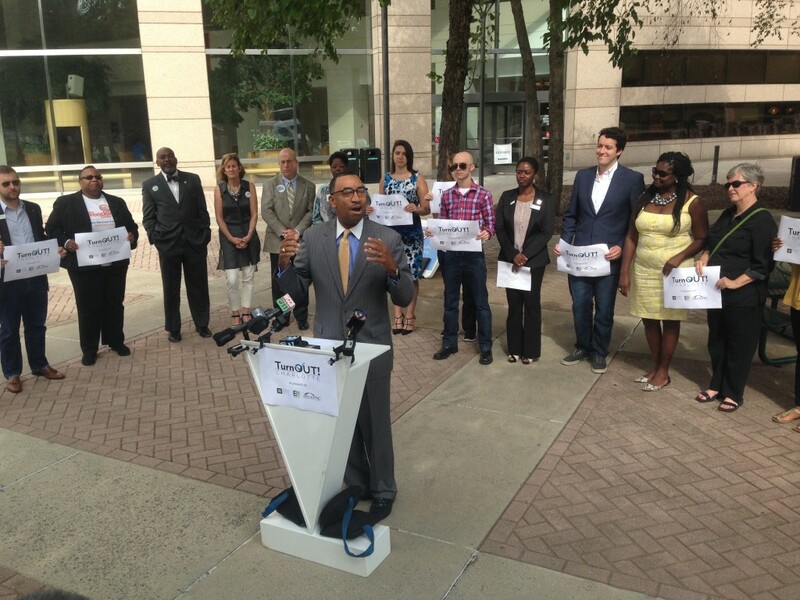 is being billed as a “first-of-its-kind” campaign in Charlotte. The last time LGBT community members came together in such a large electoral campaign was in 1998, when MeckPAC was founded to oust the “Gang of Five,” five Mecklenburg County Commissioners who voted to strip public arts funding after the controversial play “Angels in America” was staged in Charlotte. Four of those five were ousted; Commissioner Bill James has remained a fixture on the Mecklenburg County Commission since. — Matt Comer is the former editor of QNotes, the Charlotte-based LGBT community newspaper of North Carolina. He now freelances and blogs at mattcomer.net.